Emma qualified as a nurse in 2009 and spent three and a half years working on the military trauma and orthopaedic ward at Selly Oak. She obtained a BSc in Trauma and Orthopaedics in 2012. 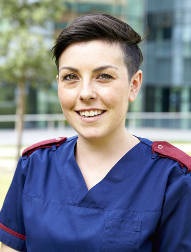 In January 2013 Emma started working on Trauma Critical Care, spending two years caring for patients with potentially life-threatening conditions. She began working at the NIHR SRMRC in April 2015 after developing a passion for trauma care and believes research is key to helping to improve outcomes for critically ill patients.